Aquaculture has gained a momentum throughout the world during recent decades which is unparalleled in other branches of food production. 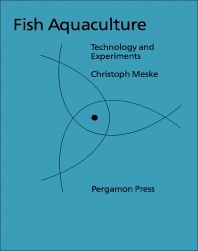 This book describes methods currently used for the production of those warm water table fish which are of major importance. Included are experiments and procedures which will help to combat the growing food problem through new production methods for animal protein. The aim of the work presented here is to promote the continuous production of warm water table fish independently of climate or environment within the least necessary space and even in regions with unsuitable weather or topography. For agriculture students, and fish farmers/researchers. Introduction. Aquaculture - the concept. Aquaculture - in practice. The development of new techniques for aquaculture. Research into the management, feeding and breeding of carp in warm water. Experiments on the management, feeding and propagation of other warm water cultured table fish. The application of warm water fish culture in research and practice. References. Index.